Fredrik Fan Cheung-fung was born in Hong Kong in 1989. He did not witness the events of that restless summer; he never saw hunger strikes or tanks in the streets. But, he says, he inherited the legacy of the attack on student protesters in Beijing's Tiananmen Square that left hundreds, if not thousands, dead. Twenty years after the crackdown, just shy of his 20th birthday, Fan embarked on a 64-hour fast of his own, setting up camp outside a busy shopping center in Hong Kong's Times Square, some 1,240 miles (2,000 km) from Beijing. As he stood in his small, blue booth flanked by fellow students, a gigantic television screen  not a portrait of Chairman Mao  watched over him. But as Fan greeted the commuters and shopkeepers who passed by, he glowed with the same nervous energy, the same youthful optimism, of those who came before. His goal: "To keep their memory alive." 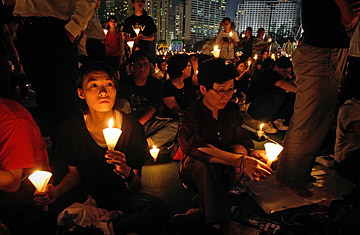 Remembering Tiananmen Square is a task Hong Kong people take seriously. This is the only Chinese city where the incident is openly discussed and publicly remembered. In the summer of 1989, some 1 million people took to the city's streets in support of the students. They've honored them every year since. But remembrance is an amorphous term, especially here. The solemnity of recollection is tempered by anger and fear  anger that China has not acknowledged the incident, and fear that heavy-handed suppression is not a thing of the past. "What happened 20 years ago could happen again," said Zoe Yiu, a 20-year-old student attending the vigil for the second time. "And now we worry that it could happen here too." It is a delicate balance, one that pro-democracy advocates worry is tipping toward Beijing. Last year the Chinese government postponed direct elections in the territory, bumping the date from 2012 to 2017 for the chief executive and to 2020 for the legislature. The move outraged veteran campaigners like Martin Lee, Hong Kong's "Father of Democracy." Lee, recently the target of a foiled assassination plot, says Beijing is buying time, stacking the democratic deck. "They have postponed and postponed," he says. "Hong Kong will not have democracy until Beijing knows they have people who can win." Many, including prominent Hong Kong legislator Emily Lau, worry that Beijing is stifling Hong Kong's notoriously raucous press. She points to a new report by Freedom House, an American NGO that tracks freedom-of-the-press issues, which labeled Hong Kong's press corps "free" in 2008, but downgraded it to "partly free" in 2009. The problem, Lau says, is not outright repression but self-censorship. "People are getting too scared to speak up." But speak up they do  as pro-Beijing commentators are quick to point out. "Where is the threat?" asks Lau Nai-keung, a Hong Kong journalist with ties to Beijing. "People here can express their feelings." Indeed, when the city's chief executive, Donald Tsang, recently downplayed the anniversary to legislators during a legislative council debate, he was met with fierce opposition and forced to apologize. When Ayo Chan, a student leader at Hong Kong University, suggested pro-democracy protesters were to blame for the 1989 crackdown, angry students moved to vote him out of office. And, unlike the uprising in Tiananmen Square 20 years ago, Fan's Times Square protest unfolded peacefully, unfettered by the government. Hong Kong people remember Tiananmen, and they cherish the fight it has come to represent. Tens of thousands said so at Victoria Park today. They just wonder if Beijing will hear. Read: "China Cracks Down Ahead of Tiananmen Anniversary." See pictures of the 1989 Tiananmen Square uprising.